BOOK A COACHING SESSION NOW! If you like what you see and you'd like to have some coaching sessions with me then please feel free to get in touch through the site contact form! Below is an article that was taken from the Dry Blackthorn Cup in 1977. I think it's a nice article that summarises my involvement in the game and the levels I reached along with providing you with a little insight into some of my achievements. 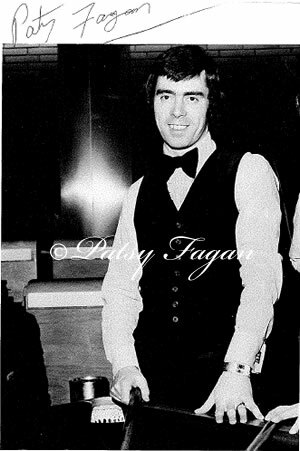 Patsy is snooker newest "Pin-Up Boy", the most exciting prospect to burst on the scene since Alex Higgins. Now based in London, the mercurial 25 year old irishman earned that tag when he stunned snooker's pundits earlier this month by winning the first ever UK Professional Snooker Championships in Blackpool from a star studdied field. A professional for just over a year, his impact has been brief but dramatic. Watched by millions of BBC Grandstand viewers, his victory in the U.K. confirmed his virtuosity as one of the worlds outstanding players. At 16, tempted by the bright lights of the big city, Patsy, one of a family of ten, set out from his home in Dunloaghaire, Southern Ireland, in serach of that elusive pot of gold. Although still an amateur, it wasn't long before he gained a reputation as a big money player. Matches against professionals for thousands of pounds he once played Alex Higgins for £3,000 made him a force to be reckoned with. With the cold steel temperament of a winner he had some of the big boy's quaking in their boots! His amateur career was, however, frustrating. He badly wanted to win the English crown which would have ensured him a place in the professional ranks at an early age. But it was a case of, so near, yet so far. He had to be content with the runners-up spot in 1975 when he lost to ray Edmonds and the following year was surprisingly beaten in the Southern are final by the eventual winner Chris Ross. But things began to happen for the modest and retiring Fagan when he turned professional in 1976. He won two of the most important pro am events in the snooker calendar and although beaten by Ray Reardon in this year's world professional snooker championships, he produced some brilliant safety play which allied to prolific potting served notice that he's arrived. He has made over 900 century breaks already but his biggest moment came on his 25th birthday last january when he presented himself with the perfect present his first maximum score of 147. Looks can sometimes be deceptive and in Patsy's case never more true. For behind that youthful, even angelic, face lies a fighter who never knows when he's beaten. In the semi-final of the U.K. Championships he faced certain defeat when he trailed eight frames to five and 65 - 0 with his opponent, Manchester's John Virgo needing only one frame for victory. In an epic fight back he took that frame and the next three in a feat that would have taxed even the imagination of the great Houdini! That win has given him the security he needed and it came as little surprise to his closest friends when he immediately announced his plans to marry fiancee Elaine next October. Like Higgins, Patsy has that magical quality that attracts the crowds charisma. His one burning ambition is to win the world title and with age on his side it must only be a matter of time.